Kris Norris teaches the song "Convalescence" by his former band Darkest Hour. This song is on the record Undoing Ruin. To be honest I came here to learn how to play a guitar... but now I'm a fkin fan =) BADASS! totally sick kris. you have a 7/8 string right? Learn to play songs from Darkest Hour's Kris Norris. Kris teaches this song from his former band Darkest Hour. It uses the musical form "Passacaglia." Kris Norris teaches the song "Convalescence" by his former band Darkest Hour. Kris teaches the solo from the song "Tunguska." This song can be found on the albumDeliver Us by his former band, Darkest Hour. Kris takes you through this song from Deliver Us by his former band, Darkest Hour. Kris teaches you this song from Undoing Ruin by his former band Darkest Hour. Kris teaches you this song from Deliver Us by his former band Darkest Hour. 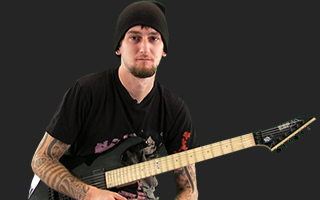 Kris Norris teaches this sludgy down-tuned metal song from the band Entombed.